With the high-profile assassinations of John and Robert Kennedy, Martin Luther King and Malcolm X in the previous dozen years, the attempt on the life of Governor George Wallace in 1972, corruption oozing out of the Nixon White House and deep mistrust of the government over the Vietnam War, conspiracy theories were mainstream in the early 1970s. The Parallax View is a botched attempt to confirm that, indeed, government-sponsored assassin teams are crawling all over the landscape killing people to serve some unstated but clearly evil purpose. Newspaper reporter Joe Frady (Warren Beatty) is covering Independence Day celebrations at the Seattle Space Needle when Senator Charles Carroll is assassinated. A judicial commission concludes that the gunman acted alone. Three years later fellow reporter Lee Carter (Paula Prentiss) visits Frady and insists that her life is in danger: six other people who were also present at the Space Needle have since mysteriously died. Soon enough, Carter herself is dead. Frady, a former alcoholic, starts to investigate despite the misgivings of his editor Bill Rintels (Hume Cronyn), and travels to the small town of Salmontail, where a judge who witnessed the Carroll assassination supposedly drowned while fishing. After tangling with the local sheriff's department Frady uncovers evidence of something called The Parallax Corporation, seemingly a recruitment organization for assassins. As Frady delves further into the events surrounding the Carroll murders and Parallax, he becomes a target until he fakes his death and applies to Parallax himself under an assumed identity. The Parallax View stumbles badly and early as any semblance of an intellectual approach is quickly ditched in favour of abject and random mayhem completely at odds with the film's premise. Supposedly surgically precise killing teams get sloppy in a hurry. Explosions become common: both a boat and an airplane are destroyed by messy bombs that don't seem to raise any interest from police authorities. A plot to murder Frady is hatched and clumsily bungled at a remote dam site. And The Parallax View suffers from reporter-becomes-superhero syndrome: Frady can out-punch a sheriff's deputy, drown the sheriff, tail a professional assassin all around town without being noticed, and survive three separate attempts on his life, almost comically reappearing unscathed at the office of his newspaper editor after every brush with death. The film does not even begin to offer theories on what is motivating all the killing. A lot of screen time is invested working up the six other murders related to Senator Carroll's assassination, but no explanation is ever provided for any of the actual or attempted killings. This is a likely intentional underlining of the all-powerful-dark-forces-getting-away-with-anything premise, but it also smacks of lazy film-making: allow the bad guys to kill at their leisure without the burden of explaining themselves. Amidst the dropping bodies and gaping plot holes, Warren Beatty meanders through the film attempting to act cool but appearing mostly disinterested. His lack of emotional reaction to all the violence comes across as a robotic detachment from the evil supposedly surrounding him, and combined with his remarkable survival skills make Joe Frady a character that can only exist on paper. 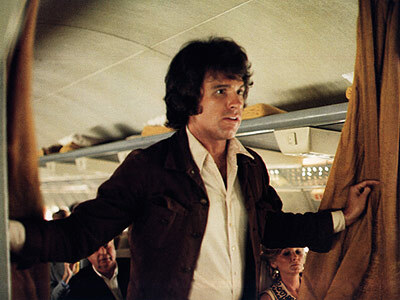 Director Alan J. Pakula and cinematographer Gordon Willis almost succeed in keeping the film interesting with some excellent framing, dynamic angles and some terrific camera placements, the scenes at the Seattle Space Needle, on-board the threatened airliner and at the auditorium where the film climaxes being particular highlights. Conspiracies only work when less is known about them. The Parallax View attempts to keep the shrouds dark, dusty and menacing. Instead, it stumbles on cheap carpet and falls flat into the harsh light. Interesting! This film is well-loved and considered a classic by many. I know my opinion is definitely not mainstream on this one! There are some admired filmmakers that I generally don't connect well with (Pakula and Altman are two examples), and also some actors who are not favorites of mine (I am generally not a fan of Warren Beatty's work, for me he is often too smug for his own good). I also often have a problem when serious films contain blatant self-contradictions, and I cannot get past that. A journalist becomes an action hero and goes through everything Beatty goes through in The Parallax View and no suspicions whatsoever being raised by the authorities? Supposedly surgical and expert hit-teams suddenly becoming sloppy and unable to get rid of a pesky journalist? Sorry, I could not buy it. The film is flashy and well made, but in this case style over substance does not wash for me. Yes, I have also a few respected filmakers which I don´t like too much - for example Fellini and Pasolini - I like only a couple of their films and most of them don´t. To Pakula I don´t have any specific conncetion as well, I like Klute, Parallax, Starting Over and Sophie´s Choice but All the President´s Men I didn´t like. From Altman I like also some films - Short Cuts for example - but I wasn´t too excited about Nashville. Just like you I don´t consider Beatty being in the same acting league with De Niro, Pacino, Hoffman and Nicholson. And to Parallax - you write, that they´re unable to get rid of him, but they take him down eventually, so? :) But ok, I get it that you just don´t like this film and it´s okay.